Is Old Green Science Behind The New Blue State/ China Alliances? Is Old Green Science Behind The New Blue State/ China Alliances? 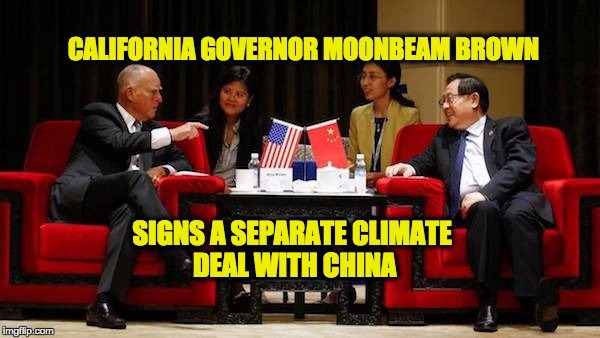 Is Old Green Science Behind The New Blue State/ China Alliances? Climate Solutions was a franchisee of the notorious Earth Island Institute, a radical anti-American organization when this small obscure environmental group was selected by the government to operate some of the largest scientific research programs in US history. Climate Solutions produced the Poised For Profits report in 2001 that was later utilized by another secretive government controlled non-profit calling themselves the Prosperity Partnership, which created a Regional Economic Agenda to corner the global market on climate-friendly products and services. Most Americans have never heard of Climate Solutions, the Prosperity Partnership or any aspect of the agenda of the EPA’s Billionaires Club, a shadowy group first identified in a 2014 Senate Report. This is partly due to a decades-long media ‘blackout’ of all information regarding the EPA’s business ventures, but mainly from the fact that our FBI, NSA, and CIA have illegally ‘intercepted‘ and destroyed all evidence of government corruption and self-dealing on behalf of the Obama Administration since the inauguration back in 2009. Much of this illegal government spying and intercepts were designed as a form of intimidation in order to suppress any dialog on the flawed science propping up the ENERGY STAR brand, arguably the most corrupt federal program in US history. National security was used as a tool for censorship of opposition to the domestic policy by the Obama Administration and our entire political establishment knew about this illegal activity for several years. In October of 2016, government officials notified the FISA court about the illegal surveillance of millions of private citizens, in which Judicial Watch declared that the “signal communications” of private citizens had been intercepted for purely political purposes in full violation of the Court directives. Interceptions were imposed by the FBI to simply censor the opinions of perceived political enemies declared as Non-State Hostile Intelligence Services for whistle-blowing activities. I’ve been the target of this corrupt practice for several years for posting articles critical of the scientific research and quality of the technical reports relied on by the government, specifically those related to the ENERGY STAR brand of ‘certified’ government energy efficiency. My alleged crime was exposing the easily provable lies about the EPA’s multi-billion dollar commodity which tolerates no competition from the private sector or questions from the public regarding its extraordinary energy saving claims. Last year US Attorney General Loretta Lynch was threatening to bring RICO charges against science deniers like myself, while former FBI Director James Comey’s was operating the largest spy program in history for purely political purposes. Manipulation of energy markets has always been the primary objective of the progressive agenda through the use of junk science produced by the EPA which couldn’t be questioned by anyone. That all ended with the stroke of a pen as President Trump swept away decades worth of bad regulations, including the science propping up the disgraced former AG Lynch’s legal theories. Priceless! The repeal of the ENERGY STAR mandate requiring government agencies to purchase EPA products and services represents one of the most important government reforms in decades. This is huge! This action essentially opens the US government, the world’s largest procurement agency with a trillion dollar annual budget to honest competition from American business for the first time in decades. When coupled with President Trump’s Buy American-Hire American policies it provides the key to unlocking real job and wealth creation. Competition for government contracts will breed transparency, which is essential to reforming corrupt bureaucracies accustomed to catering to political donors. When the Blue States recently announced the formation of alliances with China to preserve the so-called momentum of the Paris Climate Accord, progressive leaders were committing to the continued use of the ENERGY STAR brand as the sole source for emission reductions through energy efficiency and to the use of EPA’s energy experts for conducting all the measurement and verification of energy savings for the entire world. Politicians failed to point out this glaring double-standard when speaking about this voluntary international agreement, which is non-binding on everyone except US taxpayers expected to foot the bill. When the EPA convinced Canada, Japan, New Zealand, Australia, Switzerland, Taiwan and the European Union to mandate the use of ENERGY STAR for their emission reductions, how was the issue of verification of energy savings addressed? Did any of those foreign leaders bother to ask why China, the largest manufacturer of ENERGY STAR products failed to mandate the use of the EPA brand by their own government? Or did it ever matter? Media can’t actually report on this old and totally discredited system because the USA has never had a National Standard for the measurement and verification of energy savings in technologies. All of the multi-billion dollar energy-saving claims come from bureaucrats and the media has known about this dirty little secrets for many years. Media Foundations and EPA Partners are virtually the only groups supporting the ridiculous narrative of Settled Science, a completely delusional theory built on blind faith. The EPA claims their superior brand of certified government energy efficiency has been saving 25-50% more electrical energy than identical products since 2009 when the Obama Administration released the EPA: Lead By Example guideline for state governments. Which became the basis for the Save Energy Now program and the Clean Power Plan. This also coincides with the start of the FBI’s massive spy program first initiated by then-FBI Director Robert Mueller and the ‘interception’ of content posted on-line by opponents of Obama’s back-room plans to expand the EPA. The FBI specifically targeted citizen’s that questioned the science behind EPA’s new multi-billion dollar commodity. Those bogus energy saving claims came in large part from the Northwest Energy Efficiency Alliance from which the all of ENERGY STAR’s extraordinary energy efficiency claims first originated. NEEA also conducted the Industrial Energy Efficiency Alliance which served as the foundation for Obama’s Save Energy Now program, another federal program open only to political insiders. NEEA was the original model for all the other government energy efficiency non-profits spouting the nonsense of consensus by bureaucrats as part of the scientific process and demanding action in the form of cash. Save Energy Now represented the classical business model for the progressive movement, all talk, and no real action. This $100 billion federal boondoggle operated by the Department of Energy had 24 universities conducting ‘free’ audits for industrial facilities of EPA’s corporate partners, then claiming to have saved billions of dollars from these pathetic audit reports. Government energy efficiency was also the central component of Obama’s Clean Power Plan that went before the US Supreme Court last year. Lawyers made sure the term ENERGY STAR never appeared in the CPP or in oral arguments, but make no mistake about it ENERGY STAR was selected as the sole source for energy efficiency in the Fourth Building Block of the CPP. Government lawyers knew the ‘No Bid’ selection of the EPA’s own brand would create legal challenges, so they quietly replaced it with the Clean Energy Investment Program. Then the media and legal community pretended to be ignorant about this Bait & Switch scheme in a deliberate effort to hide their multi-billion dollar product from public scrutiny. We’re now supposed to believe that State governments and their non-profit pals can take these defunct, totally corrupt federal programs and make them into shiny new inventions. Contrary to popular opinions, US taxpayers own the ENERGY STAR brand and every other product created through publicly-funded research. Those programs may be pure crap, but they’re our crap. This national disgrace of EPA junk science must be addressed once and for all, but not by pretending it doesn’t exist. We need to not only shut down these corrupt government-funded non-profit ventures but must also fully discredit the fake science and crappy reports produced for political officials. America must return to the use of real math, science and law for the development of energy policies going forward. Otherwise, progressive lawyers will continue to use this same fraud-based science as a tool to stifle all honest competition. Trillion dollar markets are in play and it’s American business community that is about to prosper big-time under President Trump’s American First economic agenda. Millions of real jobs and business opportunities are being created by this administration to replace the Pay To Play business model of the phony environmental movement. It’s time to quit worrying about the next media meltdown and start looking for real opportunities being created by the economic reforms occurring through true leadership.